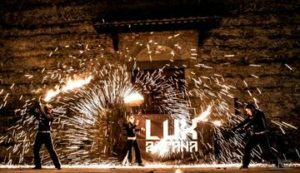 The show deals about a contest among artists who challenge to reach the whole domain of the art of fire; the strongest element is here represented as sparkling rains, enchanting dances, precise coreographies and impressing flames. During the performance, the artists mix dances, martial arts and different juggling technics up, showing new effects and peculiar suggestions every single time. The acts are based on effective sound tracks giving full emotions. the “WOW” effect on the audience is guaranteed by the many special effects. Save the date: 12th August at 9.30 pm by the Main Church Yard in Premadio.